The concept of “the gift” was a central source of inspiration for Pia Camil’s new installation in her exhibition “A Pot for a Latch.” As described in Marcel Mauss’s anthropological text The Gift (1932), the ritual act of gift exchange challenges assumptions about modern structures of economic value, consumption, and circulation, particularly when performed within an institutional site of display or commerce. 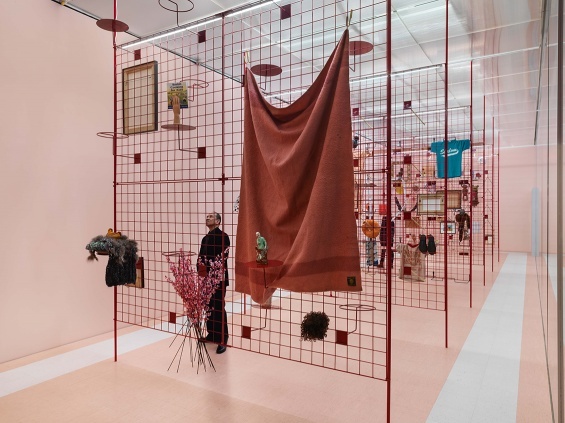 During this tour, we will consider how the formal characteristics and participatory aspects of this installation act together within the physical and conceptual space of the New Museum. In particular, how does our relationship to the art object shift when we are asked to reflect on its value and permanence in new ways? New Perspectives tours are led by the New Museum Teaching Fellow, an emerging scholar in art history or a related field. The topics of the tours are based on the Fellow’s ongoing research and change monthly, engaging participants in uniquely focused examinations of selected objects and installations. To read descriptions of current and upcoming New Perspectives tours, please view the calendar. New Perspectives tours are free with Museum admission. Due to limited capacity, please preregister here. New Museum Teaching Fellow Maggie Mustard is a PhD candidate in the Department of Art History and Archaeology at Columbia University, where she is completing her dissertation on postwar Japanese photography. The New Perspectives tour program and Teaching Fellowship is made possible through the generous support of the Andrew W. Mellon Foundation. Additional support is provided by the Toby Devan Lewis Emerging Artists Exhibitions Fund and the Neeson / Edlis Artist Commissions Fund. Special thanks to Blum & Poe and Galería OMR.